In this action, Plaintiff Town of Orleans asks the Court to determine the location of the boundary line between the Town of Orleans and the Town of Eastham. On May 19, 2016, each party filed a Motion for Summary Judgment as well as an opposition. Plaintiff alleges the original town boundary line, established by the Massachusetts Legislature, has been affected by coastal erosion and accretion, and the court should relocate it in response to those changes as authorized under G. L. c. 42, § 1, and G. L. c. 185, § 1. Defendant argues the Land Court does not have authority to change the municipal boundary line because it is an ascertainable fixed line, the location of which is not in dispute, and is not affected by the coastal erosion and accretion cited by Plaintiff. [Note 1] The court agrees with the Town of Eastham and declines to relocate the municipal boundary. 1. The Town of Orleans was established by an act of the General Court, Chapter 64 of the Acts of 1796 (Chapter 64), when the "South Parish" of the Town of Eastham was incorporated as the separate Town of Orleans. 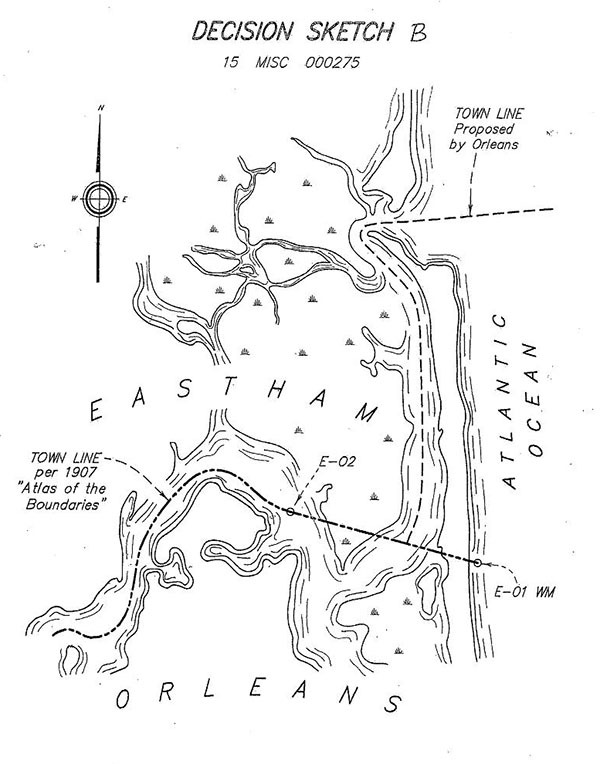 "The dividing line between the towns of Eastham and Orleans is established as follows: Commencing at the middle of the mouth of Rock Harbor River, thence up the middle of said river to a point opposite a stake standing on the northerly side of said river; thence north sixty degrees east, twenty-six rods and eighteen links to a stone monument marked E.O., standing in the north-east side of the road leading to the mouth of Boat Meadow River; thence same course, fifty-five rods twenty links to a stone monument marked E.O. ; thence same course forty-five rods seven and one-half links to a stake on Boat Meadow near the west side of the canal; thence south nineteen degrees east one hundred twenty-six rods fifteen links to a stone monument marked E.O., standing on the south side of the road at Rock Harbor Gap; thence same course fifty-one rods five links to a stone monument on the south side of the county road near the town cove marked E.O. ; thence same course into the middle of said cove, to a large stone on the middle of Stony Island, marked E.O. ; thence south sixty-seven and one-half degrees east to a stone monument standing on Nausett Beach, marked E.O. ; thence same course into the ocean; from thence returning to the first point, to wit, the middle of the mouth of Rock Harbor River, thence north forty-five degrees west into Barnstable Bay; and the said line as above described shall hereafter be the dividing line between said towns." 4. The Harbor and Land Commissioners most recently located and defined the boundary between the towns in the 1907 Atlas of the Boundaries of Towns of Barnstable, Dukes County, and Nantucket Counties (1907 Atlas). See Exhibits B and C to the parties' Agreed Statement of Facts for Cross- Motions for Summary Judgment. The relevant portion of the municipal boundary line in question is depicted in the survey designated "Eastham-Orleans 1-2" on Folio 22 of the 1907 Atlas. 5. Recorded in the Barnstable Registry of Deeds as Plan 91 in Book 166 is a plan titled "Plan of Land in Orleans, Mass. as Made For the Town of Orleans Under Article 17 of the 1954 Annual Town Meeting Warrant," dated August 1954 by Arthur L. Sparrow Co., Engineers (1954 Plan). 7. 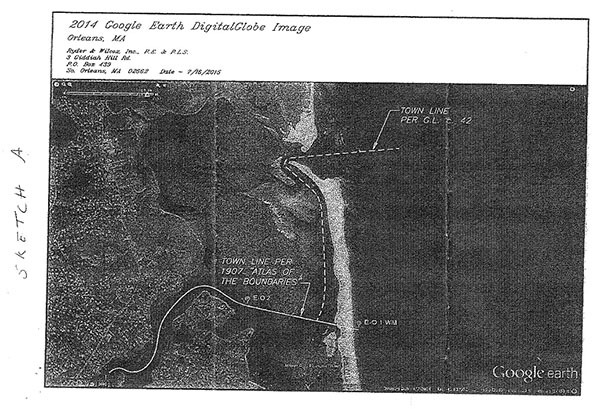 On the date the complaint was filed, the spit or boundary beach located to the south of both the Town of Orleans' proposed boundary and the current municipal boundary line extends southerly and connects with the mainland at Nauset Heights in Orleans, where it can be accessed by foot or vehicle. "The boundary markers of every town shall be located, the marks thereon renewed, and the year located marked upon the face thereof which bears the letter of the town locating its boundary, once every five years, by at least two of the selectmen of the town or by two substitutes designated by them in writing. The marking shall be made with paint or other suitable marking material. The proceedings shall be recorded with the town clerk and the board of selectmen of the town in writing signed under penalty of perjury setting forth which boundary marks were located, and those which were not located. A copy of such records shall also be sent, by registered letter, to the town clerk and the board of selectmen of any contiguous town. 9. On June 1, 2012, selectmen and other officials from both Orleans and Eastham conducted a perambulation pursuant to G. L. c. 42, § 2, and located and confirmed relevant Witness Marks on the 1907 Atlas, including those relevant to this case (point E-O-1 observed to be a concrete post painted orange, and point E-O-2 painted "O/E 2012"), consistent with the record town boundary line established by the Legislature. [Note 4] The official report of the perambulation confirms "none of the markers or witness marks appeared to be in a different location than was observed on previous perambulation excursions." Under Mass. R. Civ. P. 56 (c), "Summary judgment is appropriate when, viewing the evidence in the light most favorable to the nonmoving party, all material facts have been established and the moving party is entitled to judgment as a matter of law.'" Regis Coll. v. Town of Weston, 462 Mass. 280 , 284 (2012) (internal citations omitted). The moving party bears the burden of affirmatively showing there is no triable issue of fact, even if that party would not have such a burden if the case were to go to trial. See Ng Bros. Constr., Inc. v. Cranney, 436 Mass. 638 , 644 (2002). "A nonmoving party's failure to establish an essential element of [their] claim renders all other facts immaterial' and mandates summary judgment in favor of the moving party." Roman v. Trustees of Tufts College, 461 Mass. 707 , 711 (2012) (internal citations omitted). When the court is faced with cross motions, as is the case here, it must analyze the parties' legal positions at the summary judgment stage guided by which party has the burden on the issues before the court. The issue in this declaratory judgment case is ripe for summary judgment because the material facts are not in dispute and the case may be decided based on the application of law to those facts. As the party seeking to change the extant legislatively established statutory municipal boundary line, Orleans has the burden of proof and persuasion. "The seaward boundary of cities and towns bordering on the open sea shall coincide with the marine boundary of the commonwealth. The boundary lines in tide water between adjacent coastal municipalities, as located and defined by the board of harbor and land commissioners under chapter one hundred and ninety-six of the acts of eighteen hundred and eighty-one, except in so far as the boundary lines so located and defined purported to vary boundary lines in tide water between municipalities theretofore established by the general court, together with such boundary lines theretofore so established, as such boundary lines have been subsequently changed by the general court or defined by decrees of the land court, with such additions to or subtractions from the length thereof as have been made by natural changes in the shore line of the commonwealth, are hereby confirmed and established as the legal boundary lines in tide water between said adjacent municipalities; provided, that such boundary lines shall hereafter be changed from time to time to conform to any change in said shore line." Although the statute does allow for the boundaries in tide water to be changed from time to time to conform to changes in the shore line, the Land Court is not given the authority to make those changes. Section 1 of the statute specifically gives the General Court the ability to change the boundaries, while the Land Court has the ability to define boundary lines by decree. "Define" is the operative word. This court has the ability to define boundaries, but does not have the authority to change them in the manner Orleans urges. A change in boundary under this section may only be achieved through legislative process. The situation presented here is not one that implicates the language of Section 1, allowing for changes to boundaries established by the General Court or defined by the Land Court to adjust to "such additions to or subtractions from the length [of the boundary line] as have been made by natural changes in the shore line of the commonwealth." The change in boundary line sought by Orleans is not an extension of the original fixed line boundary necessitated by accretion at the point where the municipal boundary is "bordering on the open sea." Instead, Orleans is seeking a redirection of the fixed municipal line so as to change it substantially, rather than simply address the need for addition or subtraction due to natural changes at the ocean edge. "[i]f the true boundary between two or more adjacent counties, cities, towns or districts is doubtful or in dispute, the land court may determine the location thereof upon the petition of one or more of such counties, cities, towns and districts and after such notice to all other counties, cities, towns and districts interested as the court shall order, and the court may make such order as to the setting of durable bounds to perpetuate the lines the location of which is so determined, and as to the costs and expenses of the proceedings, as law and justice may require." (emphasis added). In order for the Land Court to have jurisdiction to "determine" where a boundary between municipalities is located under Section 12, the boundary line must be "doubtful or in dispute." While the parties agree there is an actual case and controversy between them over control of vehicular activities on the portion of the Orleans Spit that lies within the boundaries of Eastham, the municipal boundary itself is neither doubtful nor in dispute within the meaning of Section 12. [Note 5] Further, while some of the municipal boundary line between the towns is within tide water, the actual established boundary is a fixed line, not one dependent on the ebb and flow of a water line. Orleans does not claim the boundary line between the towns has changed or become doubtful due to the altered landscape at the municipal boundary line. Rather, Orleans is asking the court to establish the boundary line in a new location in response to natural changes along the coast line itself which have affected access to Orleans from the Atlantic Ocean. Orleans seeks to ameliorate the consequences of the coastal changes, but there is no doubt or dispute within the meaning of G. L. c. 42, § 12, as to where the boundary line is and always has been located. The municipal boundary line, established in in 1796, has been determined, marked and ascertainable over decades' time and the relevant county and municipal authorities have consistently located the 1907 boundary markers without dispute or disagreement as recently as 2012. Plaintiff has failed to establish the authority of this court to change the municipal boundary pursuant to G. L. c. 42 § 12, under the circumstances presented. Therefore, Orleans' Motion for Summary Judgment is DENIED and Eastham's Motion for Summary Judgment is GRANTED. Since the complaint seeks relief under G. L. c. 231A, the court may not dismiss the action, and the judgment will declare that the boundary line between the two towns remains as legislatively established. Declaratory Judgment to enter accordingly. [Note 1] Attached to this decision for illustrative purposes are: A) a copy of Exhibit D to the complaint, which is a 2014 Google Earth Digital Globe Image dated June 7, 2014, on which the current municipal boundary and the proposed boundary are shown, with the proposed line shown as "Town Line Per G. L. c. 42," and B) a sketch prepared by the Land Court's survey division duplicating the material features shown on Complaint Exhibit D and highlighting boundary markers mentioned in this decision. [Note 2] Typographical errors and inconsistencies in the original have not been corrected. "Stone Island" referred to in Chapter 64 is now known as "Stony Island" and continues to exist. [Note 3] In its complaint, the Town of Orleans refers to the accreted land as part of the "Orleans Spit," claiming title to it based on its record ownership of land under a 1961 deed of Morrill and Young to the Town, recorded in the Barnstable Registry of Deeds in Book 1105, at Page 399. The Town of Orleans' title under the 1961 deed is currently challenged in a case titled Hannah v. Town of Orleans, originally commenced in the Superior Court (Barnstable County) as BACV1015-0037, transferred to the Land Court by order of the Chief Justice of the Trial Court because Hannah claims to own some or all of the land claimed by the Town under the 1961 deed. On June 20, 2016, the case was entered in the Land Court as 16 SBQ 10859 06-001, and is styled as an "S" case brought pursuant to G. L. c. 185, because it involves the Hannah family's claim to the same spit of land based on its ownership of registered land under a Land Court Certificate of Title. The decision this court reaches today does not purport to address the issues raised in the Hannah case and does not rely on nor determine the issue of fee ownership to the accreted land in question. [Note 4] See the sketches attached hereto, depicting the location of the two Witness Markers, which bookend the portion of the municipal boundary line Orleans seeks to have this court relocate. [Note 5] See, i.e., Town of Blackstone v. Town of Millville, 59 Mass. App. Ct. 565 (2003), where the Appeals Court reviewed the Land Court's determination under G. L. c. 42, §12, resolving a dispute between the towns as to the location of their mutual municipal boundary line due to an inconsistency between the location of existing bounds and the measured distances.